Early Repolarization pattern is a common electrocardiographic finding in young healthy men and athletes. On the Electrocardiogram, its main characteristic is an elevation of the QRS–ST junction. It is generally considered to be benign, but recent studies have demonstrated that it can be linked to a risk of ventricular arrhythmias and sudden cardiac arrest 1 2 3. Elevation of the QRS–ST junction (J point) ≥0.1mV in at least two contiguous leads. Terminal QRS slurring or notching (J Waves). Prominent T waves 4 5. J Wave, J point elevation and concave upward ST-segment elevation. Absence of reciprocal changes (except in aVR). The J point denotes the junction of the QRS complex and the ST segment on the electrocardiogram. J point changes are the most important sign of Early Repolarization pattern, the diagnosis can be made even without ST elevation. 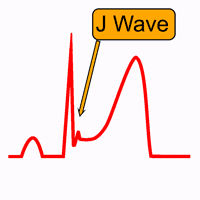 The J wave, also known as Osborn wave, is a deflection with a dome or hump morphology in the same direction as the R wave, immediately following the QRS 6. Their presence in left precordial leads or inferior leads is one of the diagnostic criterion for Early Repolarization Pattern. It is also seen in both extracardiac and cardiac disorders like Hypothermia, hypercalcemia, brain injury, hypervagotonia, or spinal cord injury 4. The other changes of Early Repolarization Pattern is a conduction delay on terminal QRS Complex. 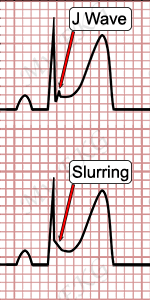 It causes QRS–ST junction slurring, without J wave. In the absence of J wave or terminal QRS slurring, diagnosis of Early Repolarization Pattern is doubtful. ST-segment elevation is not a required criterion, the diagnosis of Early Repolarization can be made even without ST elevation 4. Early Repolarization Pattern was unanimously regarded as “normal,” a “normal variant”, or a “benign early repolarization” for decades. However, this concept has been challenged. Recent studies have demonstrated that it can be linked to sudden cardiac arrest due to Idiopathic Ventricular Fibrillation 1-3. Currently it is not defined the reason why patients with Early Repolarization could be at increased risk of Idiopathic Ventricular Fibrillation. Type 1: Early Repolarization Pattern predominantly in the lateral precordial leads. Type 2: Early Repolarization Pattern predominantly in the inferior or infero-lateral leads. Type 3: Early Repolarization Pattern globally in the inferior, lateral and right precordial leads. Type 1: This form is very prevalent among healthy male athletes and is rarely seen in Ventricular Fibrillation survivors. Type 2: Is associated with a higher level of risk; numerous cases of otherwise idiopathic Ventricular Fibrillation have this electrocardiographic pattern, which is also prevalent in healthy young males. Type 3: Is associated with the highest level of risk for the development of malignant arrhythmias; it is often associated with VF storms 6. Despite the increased risk of ventricular arrhythmias in patients with Early Repolarization pattern in the electrocardiogram, the incidence of these arrhythmias is very low. The current consensus is that these patients do not require specific investigations or therapeutic interventions 7. In athletes, the sports suspension is not recommended. On the contrary, the finding of Early Repolarization Pattern in survivors of sudden cardiac arrest due to idiopathic ventricular fibrillation has indications of implantable cardioverter-defibrillator; but it would have the same indication in the absence of Early Repolarization.